"Halo 3" ODST" lets you become an elite marine dropped into a futuristic African city to fight space aliens. "Extraction" serves as a prequel to last year's extraordinary "Dead Space"
"Halo 3: ODST" takes place before the events of 2007's "Halo 3"
Two new sci-fi video games cast you in the futuristic role of a space marine who must face off against deadly creatures. However, while "Dead Space: Extraction" and "Halo 3: ODST" share this theme, and are both played from an immersive first-person perspective, the two experiences are quite different. Here's a look at each of these entertaining, "Mature"-rated titles. As an Orbital Drop Shock Trooper (ODST), part of an elite group of space marines dropped into hostile areas, you land in the fictional African port city of New Mombasa to ward off an invasion from the Covenant, an alliance of militaristic alien races. 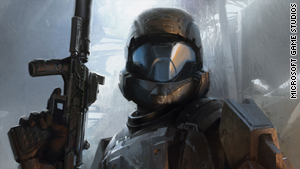 In "Halo 3: ODST," which takes place between the events of 2004's "Halo 2" and 2007's "Halo 3," you play as a new character (simply referred to as the "Rookie"), rather than the heroic "Master Chief." The gameplay offers a slower-paced, more urban-centered combat compared with previous adventures, and while you can play the game solo, it's a lot more fun to invite up to three friends to play online via the Xbox Live service. On a related note, even better than the main campaign, perhaps, is the new "Firefight" mode. This is a cooperative multiplayer video game where up to four ODST fighters can take on increasingly challenging waves of Covenant invaders, similar to the celebrated "Horde" mode from "Gears of War 2." Also included in the box is a second disc with three new "Halo 3" multiplayer maps, as well as all original "Halo 3" maps and downloadable map packs, totaling 24 in all. Serving as a prequel to last year's extraordinary "Dead Space" for the Xbox 360, Sony PlayStation 3 and PC, this new Nintendo Wii exclusive reveals what happened leading up to Isaac Clarke's deadly mission aboard the USG Ishimura mining ship in deep space. The action-heavy, cinematic game play takes advantage of the Nintendo Wii's motion control, but to better handle the limited horsepower of the console, you won't be directly controlling your character. "Dead Space: Extraction" is an "on-rails shooter" game, so you'll only have control of your character's weapon rather than his feet. That doesn't mean you won't find the game fun or challenging. Introducing new characters, weapons and enemies (including tough boss battles), this atmospheric, horror-filled tale follows a group of space colonists who vow to fight a mysterious virus spreading through the USG Ishimura and the planet Aegis VII. One of the key features of this great-looking game is join-in-or-drop-out cooperative play. That means a friend beside you can at any time pick up a controller to help blast away "Necromorph" aliens limb by limb -- or quit the game if need be -- without disturbing the intense action.